New Delhi: Talk about Bharatiya Janata Party, or BJP, veteran Lal Krishna Advani’s exit from active politics revived on Monday with his spiritual guru claiming that the leader of the opposition in Lok Sabha had expressed his desire to “distance himself from politics". “He (Advani) expressed a view to distance himself from politics, but was not clear when and at what time," Swami Vishveshwara Teerth of Pejawar Mutt, whom the BJP leader met on Vijaya Dashami day, a Hindu festival, told reporters. The spiritual mentor’s claim came a week after Advani’s party colleague Manohar Parrikar suggested that his political career was virtually over. According to the spiritual mentor, he has asked him to stay on as “the guidance of a senior leader like Advani was required in the BJP and its politics". When contacted, Advani refused to comment on the incident. He, however, did not deny the spiritual mentor’s claim. However, the BJP sought to downplay his statement. “It was a personal and private visit. Our leaders call on saints to seek blessings. Their words and blessings have to be taken in its own spirit and no politics need to derived out of it," said party spokesperson Rajiv Pratap Rudy. Political analysts feel that Advani’s meeting could have been yet another attempt to avoid quitting. “You never know. May be the seer’s words would be quoted as another reason for him to continue," said political analyst Jyotirmaya Sharma. Prafull Goradia, writer and political observer, also said it would be apt for Advani to quit now. “If he does not decide, circumstances will be forced to decide his exit," warned Goradia. 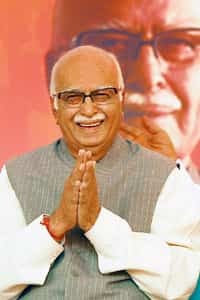 Advani, who was born in Karachi in undivided India in 1927, reached the pinnacle of his political career when he spearheaded the Ayodhya movement in the late 1980s and early 1990s. He, along with former prime minister Atal Bihari Vajpayee, catapulted the Right-wing party from a two-seat outfit in 1984 to a party leading the ruling National Democratic Alliance in 1998. Advani was deputy prime minister of the country from 2002 till 2004.